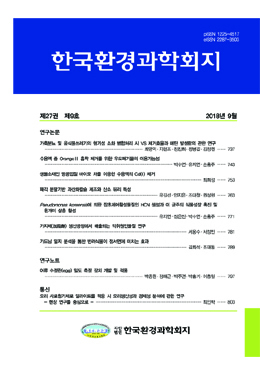 Asthma deaths in Seoul peaked on the third, fifth, and second days after the PM concentration exceeded the daily average concentration standard. We classified the synoptic meteorological conditions, based on the days involving such cases, into three categories. Type 1 included the meteorological condition likely to cause high air pollution concentrations in the leeward region, the dominant wind direction of which is the northwest. Type 2 included the meteorological condition likely to cause high air pollution concentrations due to the weak wind velocity under stable atmospheric conditions. Type 3 was when the passage low atmospheric pressure and the expansion of high atmospheric pressure occurred at the rear, indicating a meteorological condition likely to cause high air pollution, in certain regions. Type 1 occurred 11 times, with high concentrations of over 100 ㎍/ ㎥ being observed in the southeastern part of Seoul. Type 2 occurred 24 times, often accompanied by a PM concentration of 100~400 ㎍/ ㎥ . Type 3 occurred 11 times, and was accompanied by several days of yellow dust that accounted for the highest concentrations.